Taipei, the capital of Taiwan is a gem to visit for families, friends, couples and solo traveling. 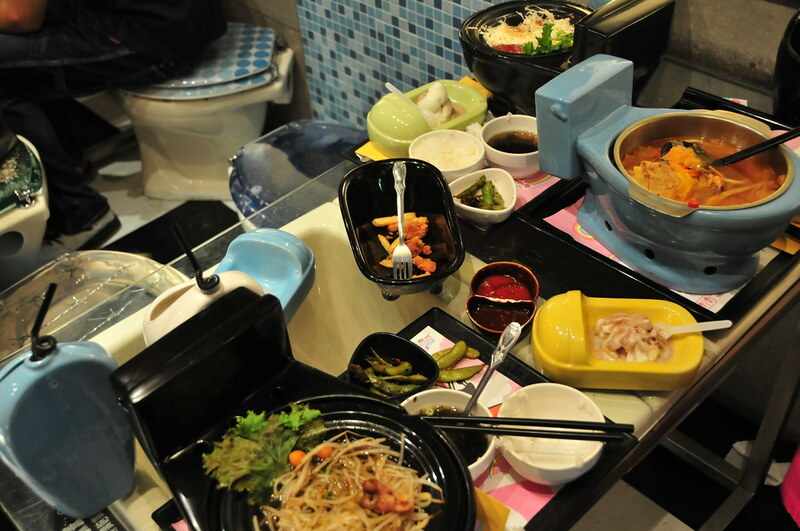 The warmth welcome of Taiwanese people will bring extra joy to your travels. From nature, culture to latest fashion, Taipei will enhance all your senses. Meowwww~~ Welcome to cat purrrrridise! 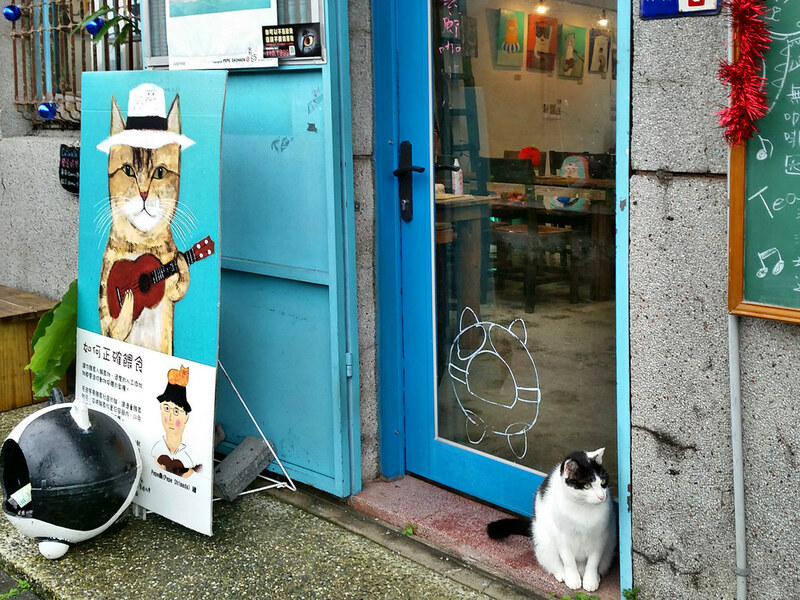 The best place for cat lovers to visit! Just as the name suggests, cats can be found in every corner of this village lazing around or maybe, up to no good. Black, ginger, white, stripes, grey, fat, friendly, shy — you will literally find cats of any kind in this cat village. Cat Cafe in the Cat Village. Image via Flickr. You can find also find anything about cats including souvenirs and EDM with cats meowing in the background. Despite cat food being sold in the village, it is advisable to only feed two till three biscuits per cat. Yes, villagers are concerned that the cats might become obese when overfed. A must-visit when in the village is the mining museum. The village is basically split into two parts by a black bridge. One part of the village is where the locals reside and the other part is a former mining area. The villagers and the Taiwanese government have put in a combined effort to preserve the old mining facilities. Additionally, the museum displays the items with English translations to help visitors understand history better. The hills around Houtong Village provides good options for hiking making the visit to the village an easy full day tour. Cafes are available all around the village so visitors don’t have to worry about their caffeine addiction while stroking cats. Houtong Cat Bridge. Image via Wikimedia. Train to Yilan from Taipei Station. It will take about 1 hour 2 minutes to reach Houtong Station. Upon reaching the station, you will have to walk 160 meters walk to the village. 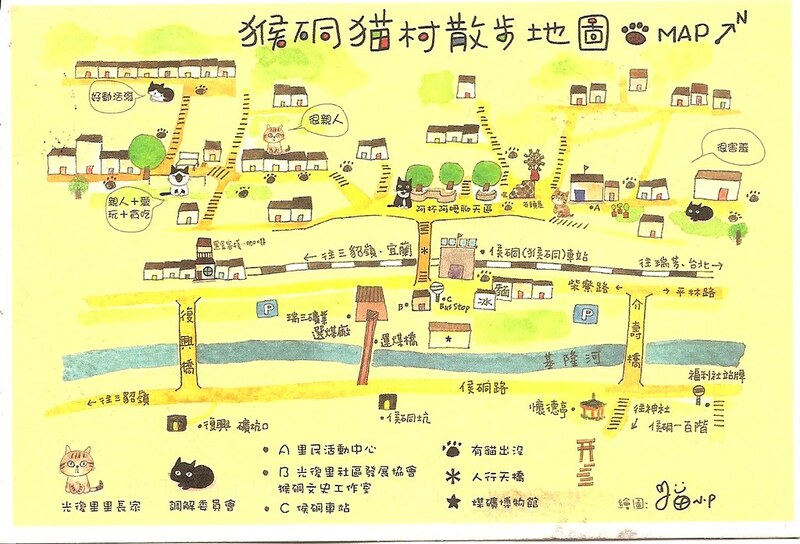 Map of Houtong Cat Village. Image via Flickr. Yes, a refuse incinerator observation deck. You read it right. Standing at 116 meters above grounds, the Beitou Incinerator Observation Deck 0ffers great views of distant mountains (Yangming, Guanyin, and Datun). From its fitted with wall-to-wall panoramic windows, visitors will also be able to see Shezi Islet sandwiched between Tamsui and Keelung Rivers. 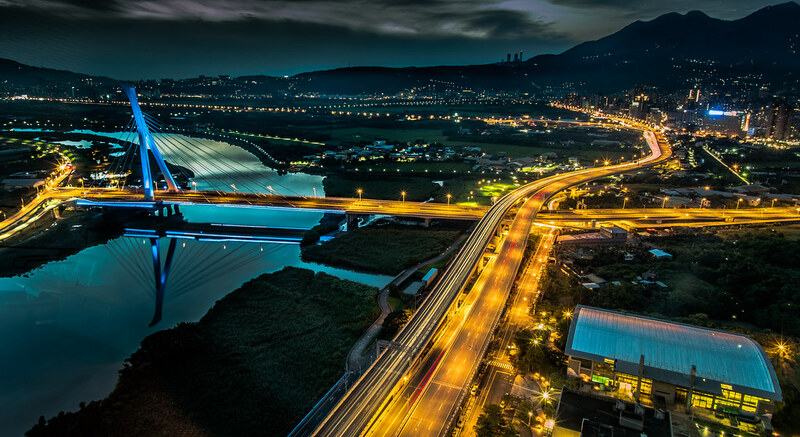 View the Guandu Plain dotted with hills, water bodies and greenery along with it renown sunset, and the beautifully lighted up nightscape of Beitou. A splendid night view from the observation deck. Image via Flickr. It is one of Taipei City’s well-known sightseeing spots for locals, complete with information signage regarding attractions visible through the window. It would be a unique experience to have dinner up on the revolving observation deck with a bird’s eye view of the city’s skyline. Take the MRT to Shipai Station and walk for 30 minutes (2.6 KM) or take an Uber for 8 minutes. View from the observation deck. Image via Flickr. If you are interested in some instagrammable and fun dining experience, this theme restaurant will be one of your best choices. However, food is average tasting though slightly higher than the average street food in Taipei city. But, hey, it’s all about the experience! Besides, staffs in the restaurant are friendly and accommodating. A plus for having kids meals too! Located right in the middle of Ximending. Take a subway to Ximen station and walk out from Exit 6. Cross the pedestrian crossing and walk along the main road running parallel to the escalator you have exited. Walk straight on Cheng Du Road and turn right at the first traffic light onto Xining Road. Walk pass Emei Road and look out for First Bank. Turn left right after First Bank and you will see a row of tattoo shops. Walk towards the end of the road where a multi-story carpark is located and the restaurant will be on your right. If you have not known it yet, Taiwan’s art and cultural scene are fairly amazing. So, seeing funny-looking or artistic buildings should be on your to-do list in Taipei. The Wanli UFO Village is a rare pod of doomed mid-century Futuro and Venturo houses lines a semi-abandoned beachfront resort outside Taipei, where some parts of the neighborhood still seem to be occupied. These flying-saucer-like houses were designed with light-weight materials by Finnish architect, Matti Suuronen. The Wanli UFO Village was extremely popular with tourists in the 1960s. Wanli UFO Village after rain. Image via Flickr. Today, it is also a good place to do some surfing if you have your own surfboard. Thus, do not be surprised to see any surfers wearing their wetsuits around this creepy looking area. There are no real aliens here! Besides surfers, this site is also popular with photographers and adventurers just like you and I. Happy exploring this un-earthly site! Take bus 1815 to Emerald Bay stop from Taipei City Hall Bus Station for about one hour. Walk pass Howard Greenbay Resort Hotel and the pods will be on your right. If you are driving, just follow Google Maps. It takes about 36 minutes drive on the highway. For motorbikes or scooters, it takes about an hour whether you take the route towards Keelung or the tranquil route through the outskirts of Yangmingshan. Remember to check the weather before heading out as the roads can be dangerous during the rainy season. The Teng Feng Fish Ball company was started back in 1940 in Taipei by a couple of war buddies. As the plastic bag technology was growing, these buddies took advantage of the sealed containers to grow their business into fish balls production and now their company has become a successful producer of fish paste products. In 2004, Teng Feng company decided to open its museum to give back to society. The process of how their fish balls are being produced are showcased in the museum and the environmental impacts of its production. The history of how the company was being incorporated and the origins of popular junk food can be seen at the museum too. Take the MRT (Tamsui-Xinyi Line) towards Tamsui Station and walk for about 10 minutes (700 meters) to reach. There are two exhibition halls; Tamsui Old Street and the former Weixiang Fish Ball Shop.